This was our second participation in IGEM. In cooperation with Heat Pump & Thermal Storage Technology Center of Japan, new explanatory panel showing the mechanism of heat pump was exhibited. During IGEM, Minister of Malaysia Energy Green Technology & Water, Dato' Sri Peter Chin visited JASE-W booth and Mr. Okano, Secretary General introduced about JASE-W and the edge of members' technologies. Japan was a partner country of this event and Japan Pavilion was located in Center of the hall. The panels of JASE-W, described the Mission of India SWG visited the petrochemical and fertilizer plants, were expressed interest. Participants of Energy Conservation Collaboration for East Asia and business purpose people visited the booth and listened to the introduction of JASE-W.
650 of Technologies and products and 700 of brochure had been handed out. In Corporation with JCCME(Japan Cooperation Center for the Middle East), activities of JASE-W and by members their products and technologies were introduced as well as display of the panels and demonstration models. Questions and Answers are actively exchanged among members and visitors. 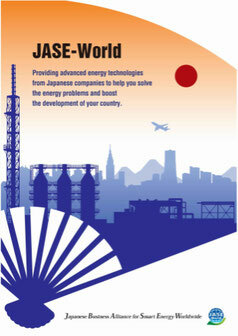 There has been great interests of Japan's advanced technologies for smart energy.